Get the most out of your device’s recharging capabilities with the iSmart 2.0 technology that detects all connected devices and adjusts the charging output accordingly. Its Smart Voltage functionality keeps the voltage consistent throughout operation to reduce charging time. Gone are the days you and your brothers had to take turns on the most conveniently placed power socket. 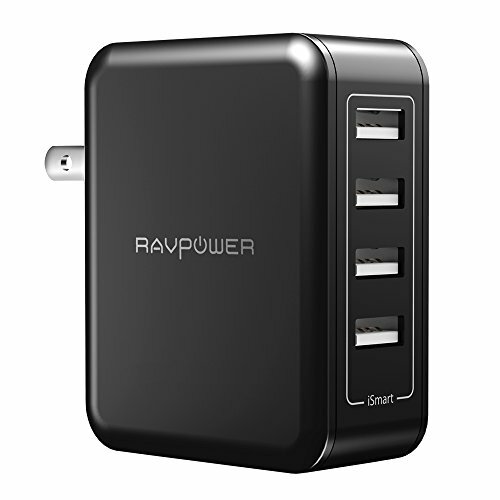 The RP-PC026 lets you charge up to 4 smartphones or tablets simultaneously at maximum speed. Ready for the next family adventure abroad? Bring just one charger for all your portable devices. The charger’s pins retract into its extremely compact construction for improved portability. Benefit from universal compatibility with the 100-240V input the charger comes with. When it comes to multiple charging, avoid assembling multiple adapters and building up hazardous connections to get the job done faster. Instead, rely on a wall charger that comes with built-in safeguards to prevent overheating, overcharging, and short-circuit to protect both you and your devices.